The Cottage 01263 715779work01603 870304fax Self-cateringWalkers, cyclists, Birdwatchers and those who enjoy a pint after a days exploring will all enjoy staying here at The Cottage. Located within the pretty village of Hickling the property offers comfortable, cosy and family friendly accommodation. With the Broads National Park on its doorstep this cottage is at the heart of a beautiful area for exploration. Hickling Broad is the largest of all of the Norfolk Broads and the home of Norfolk Wildlife Trust where you can easily spend a day walking around its trails or whiling away a few hours taking in the wildlife and scenery from one of the NWT's boat tours. The beaches of the east coast are close by and offer a great opportunity to relax and for the children to build sand castles or play hide and seek amongst the dunes. Two pubs are within walking distance of the cottage for an end of day aperitif before walking back and firing up the barbecue! • Outdoors: Patio garden with tables and chairs, barbecue. Large shed suitable for storing bikes. Walkers, cyclists, Birdwatchers and those who enjoy a pint after a days exploring will all enjoy staying here at The Cottage. 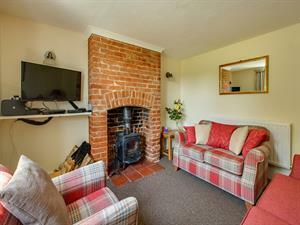 Located within the pretty village of Hickling the property offers comfortable, cosy and family friendly accommodation. With the Broads National Park on its doorstep this cottage is at the heart of a beautiful area for exploration. Hickling Broad is the largest of all of the Norfolk Broads and the home of Norfolk Wildlife Trust where you can easily spend a day walking around its trails or whiling away a few hours taking in the wildlife and scenery from one of the NWT's boat tours. The beaches of the east coast are close by and offer a great opportunity to relax and for the children to build sand castles or play hide and seek amongst the dunes. Two pubs are within walking distance of the cottage for an end of day aperitif before walking back and firing up the barbecue!